Synopsis (from Indiebound): With their father gone to America to make money for his family, Libertad, his little brother Julio and their mother scrape a living out of a dump in Guatemala City. Although it is too late for him, Libertad is determined that his little brother should go to school. Taught to play the marimba by his father, Libertad uses his talent as a street musician to raise enough money for his brother's school supplies. But his dreams for their future are destroyed when their mother is killed in a freak accident. Libertad must face the inevitable truth; they cannot survive on the streets of Guatemala City alone. There is only one thing to do. They must set out on the long and lonely journey to the Rio Grande River, where they plan to cross the water and enter the United States to find their father. 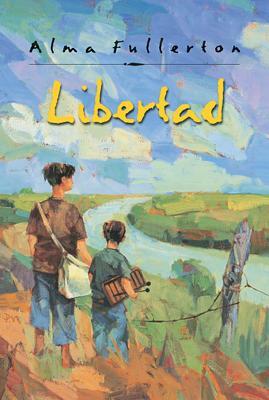 Why I recommend it: Libertad means "freedom" and that's exactly what Libertad and his brother seek. A moving and inspiring story of brotherly love, strength, despair, and hope. Like any good verse novel, each poem stands alone, yet together the poems form a whole greater than its parts. Libertad, the boy, is a sympathetic character with a strong voice, and you'll find yourself cheering on both boys as they head north to find their father. Although I've read books by Pam Munoz Ryan and Christina Diaz Gonzalez and others, I still feel there aren't enough MG Latino novels being published, despite the fact that people of Hispanic origin are the largest ethnic minority in the US. So I was happy to find this one in my quest for verse novels. for the safety of our homes. Bonus: Use as a springboard for timely discussions about the current political race and the immigrant experience. This does sound like a really moving story and so timely. Thanks for sharing it. You're welcome, Natalie. The author has other verse novels I still need to read. I love novels that tell important stories, yet do so in hopeful ways kids can connect with! Sounds like a really great read. Thanks for the recommend! Well said, Suzanne. This is definitely an important story and one kids can connect with. Unfortunately, this book is not in any library near me. I agree it sounds ideals for a good contemporary discussion on some social issues. I will note it though for my multicultural lit list. Hope you can find it eventually! I've seen this cover at the library but never picked it up. Sounds like a great story! It's a quick read, Andrea. What a great story idea. I enjoy books where the relationship between brothers is explored and this one certainly has a powerful plot. DIEGO'S DRAGONS is another Latino book I enjoyed. Thanks for the recommendation, Greg. That's exactly right, Jess. It really is different from anything else I've read. Thanks, Joanne. I will be looking for this one. You make it very enticing.